Qatar Airways has swapped its order for the A319neo in favor of the A320neo, leaving just 29-39 orders remaining for the smallest version of the neo family. Qatar became the first customer for the A319neo when it placed a surprise order at the 2009 Paris Air Show. Bombardier had negotiated a contract for 20 CSeries to be signed at the show, and with market expectations high, was embarrassed when Qatar’s CEO, Akbar Al-Baker, did one of his famous U-Turns and didn’t proceed. (Al-Baker would embarrass Boeing and Airbus at later air shows by withdrawing an announced deal for the 777-300ER and no-showing at an Airbus press conference.) We were reliably told that the French government intervened with the Qatari government to block the important CSeries order at the Paris Air Show in favor of an order for the A319neo and A320neo. Avianca Colombia retains an order for nine and Frontier Airlines has 20, according to the Ascend data base. Flight Global reports Avianca has 19 on order, however, and this is the figure shown in an Avianca presentation, probably reflecting options yet to be exercised. Avianca is scheduled to get three in 2017, two in 2018 and the rest in 2019, according to Ascend. Frontier is scheduled to begin taking delivery in December 2018 through 2020. This means the A319neo, which was supposed to enter service in 2016, six months after the October 2015 EIS for the A320neo, now slips behind the A321neo EIS. The new EIS schedule means the A319neo still is planned to enter service two years before Boeing’s 737-7 MAX but two years after Bombardier’s CS300. Embraer’s E-195 E2, which seats 133 in single class to the A319neo’s 156 in single class, is scheduled to enter service in 2019. The Frontier order is iffy, we believe. The CEO, David Siegel, told us a couple of years ago economics of the A319 aren’t very good in today’s fuel environment and favored the larger A320. Frontier was then owned by Republic Airways Holdings and was sold this year to Indigo, an investment group (not related to India’s Indigo Airlines). Indigo was principal owner of Spirit Airlines, an ultra-low cost carrier in the US. Siegel has been transforming Frontier from a low cost carrier to a ULCC. The new ownership is certain to accelerate this transition. We expect the new ownership will also favor the A320neo and A321neo, and that eventually the order for the A319neo will be up-sized. We believe Avianca will inevitably follow. This means Airbus will probably drop the A319neo eventually. The A319ceo may be retained through 2019 at steeply discounted prices, but more likely the A320ceo with deep discounts will be Airbus’ continuing competitive response to Bombardier’s CS300 and, to a lesser extent, Embraer’s E-195 E2. Boeing has sold the 737-7 only to Southwest Airlines and WestJet. Southwest is said to need the 737-7 for its Midway Airport operations. Air Canada has the option to convert some of its 737 MAX orders to the -7. Presumably if Airbus can drop the A319Neo it will give them a saving in development costs compared to Boeing, if Boeing have to build the 737-Max7 to keep Southwest happy, and that is money that could probably be usefully spent elsewhere. That said the A319, 737-7 are overdesigned and expensive for the loads / flights they mostly do. Airlines operating hot short runways and carrying pallets/ LD3’s might prefer the A319 next to their A320/321s for commonality. That said I still think a good 200 seater iso of the A319 offer a better investment / product portfolio.. That’s what the airlines are asking for. The A321 (up to 236 seats) is often too big / expensive as a A320 replacement. Thousands of A320s will be up for replacement. The never ending story about non optimized shrinks, they carry lots of weight of the base model. The trip cost of the A320 is only slightly larger than the A319 but the former offers more seats and cargo space, which all will generate more revenue (and likely, more profit). IMHO you are a bit off there. to be 45/45 with the A320 and the A321 taking up the remainder. The potential gap gives Boeing some sales opportunities. This will delay an NSA answer to Airbus further inproving the longer term future for Airbus NEO. I agree a A320 Plus would rip the 737 MAX of it’s -8/-9 capacity niche, break the 40% treshhold and push them into an NSA prematurely. Thinking of Space Shuttle Columbia. Is it correct to assume that both A350-800 and A319neo are in a very shaky situation? So, perhaps they are not going to certify nine aircraft between 2014 and 2017 after all. Not more shaky than the 737-7 MAX IMO. Who cares? It’s not like nine is some sort of magical number. Yes & I guess Airbus loves it! Promotes it! 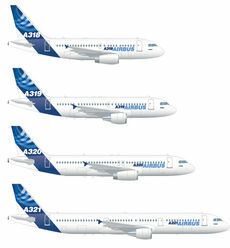 Upgrading the slots to bigger more profitable -900s and -1000s in case of the A350 and A320 & A321s in case of the A319. While cutting development costs/ time. If airlines would switch to 737s, 787s or 777s that would be bad news. But it aint. Same as 787-3, 777-200ER, 737-700 even the many 787-8s upgraded to -9s, giving some air and additional revenues to Boeing. Bombardier would love being able to have CS100s being upgraded to CS300s. As long as early CS100 slots are filled of course. Frankly I do not understand your always negative wording and suggestive questions in relation to anything Airbus. They aren’t really questions. Just your opinions with a question mark. Only approvals are welcome, answers on your blog get censored. I must assume that keesje and karelke agree that both the A319neo and A350-800 are in a shaky situation. Thanks for the answer too my question. V V how COULD you cast a shadow on Keesje’s beloved Airbus? These things are just not allowed in his world. Note last sentence “Only approvals are welcome,….”. On the subject of glass houses and throwing stones I paraphrase the above last paragraph as follows….Frankly I do not understand your always negative wording and dooms day predictions in relation to anything Boeing. Does the saying “Do as I say, not as I do” come to mind, Keesje? OK< Everyone: I remind you of our Reader Comment rules to avoid personal engagements with others that trend toward personalities. Whether VV allows or disallows certain comments on his blog is his call, and it's not relevant to anything here. Just as I tasked KC the other day for always being negative about all things Airbus, those who are always negative about all things Boeing are equally over the top. Both companies make good airplanes; some are better than their direct competitor. Let's acknowledge this. But I am getting sick and tired of this pettiness. Shape up or I will close comments. Well said sir ‘HAPPY NEW YEAR & GOOD WILL TO YOU ALL’ on both sides of the POND. I think maybe you can just forbid someone？It is obvious who started the trouble first and also in the last post. Given the non optimized nature of the 319 and 737 7 would that suggest there is a gap that the C series can exploit? Bombardier seems to be (slowly) making a nice plane to fit that niche. Neither A or B is putting much in the way of effort in trying to optimize their entrants here. Is the C series going to also be more capable and efficient? Where will that leave Embraer? Happy New Year one and all ;-). And here’s to plenty more insight from Leeham News for 2014! Thanks for blogging Scott! Uummmmppphh … I’m myself holding my mouth not to tune up with my favorite song about a better way of making use of the A319 and/or A320 cabins … to compete with CS-100 and/or -300 spot on, to force BBD (resp BCA for MAX-7) to showcase the line freight capability of their siblings (??) in a ‘First Concubine’ freight scenario … I’ll leave this discussion for some other day, today we celebrate : Peaceful 2014 !! Are there any reliable numbers out there giving the development costs for the A319neo and 737-7max on a model specific basis? If the costs are low enough, I can see airbus proceeding with the A319neo given its popularity with the (full price) corporate market. I was having the same thought: with the whole A32xNEO program being low cost overall (with probably the bulk of the cost going into the A321NEO to give a just the little bit more to do some challenging routes which are out of scope now like marginal transatlantic like the 757s), why not do the A319NEO anyway. Engines, wings and other hardware should be 99% the same as the A320 with the only major work being the software and certification. That gives the option of corporate, a A319NEO-LR and some A319NEOs for demanding routes (e.g. places like Buthan etc). If you sell a 100+ you get your money back as well as some useful customer loyalty. Happy New Year, one and all. Looking forward to happy blogging in 2014. There are loads of cheap A319s in good condition on the second hand market. I suspect.airlines looking for a smaller plane right now would go for second hand A319s in preference to the CSeries or new A319s. I also suspect the poor residuals on a new A319 would make that purchase decision difficult for Qatar. Airbus has to stretch the A319 to 36 meters(118′) to make it viable. Same for Boeing with the 737-7. Looks like they have time to work out the details. 150 seats and three lavatories is the skybus of the future. That would leave it just 1.5m shorter than the A320, or two rows of seats. At that small a difference I suspect it’s not worth having two different models. I think stretching the A319 would indeed be a waste of money. The difference between A320 and A321 is 7 meters/rows..
Ryanair explicitly cited this gap as a reason to order 175 737-800s recently. Easyjet, Jetblue, AF and others say the same. They want a 200 (199) seater. Organic growth with 4 crew members. Yes, lighter 737 frame and engines are better optimized for 150 seater market. 200 seats is for DC-10 / A300, twin aisle territory.